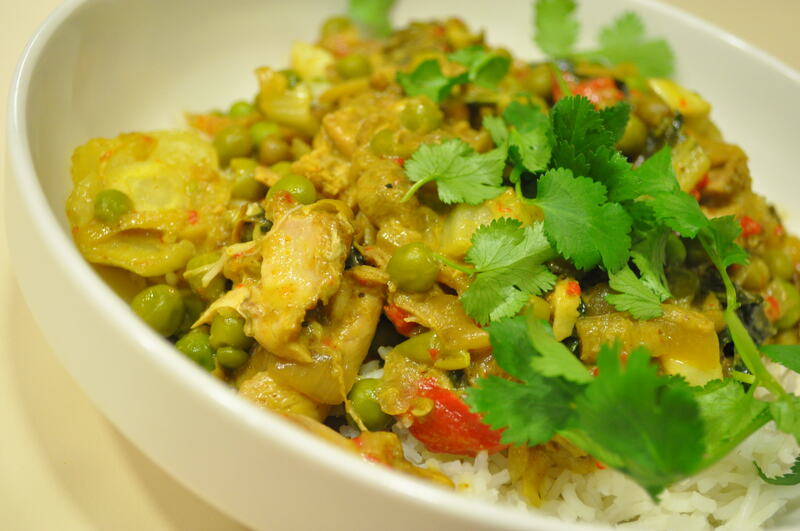 This is one of my favorite Indian curry recipes. It’s spicy, hearty, and bursting with flavor. 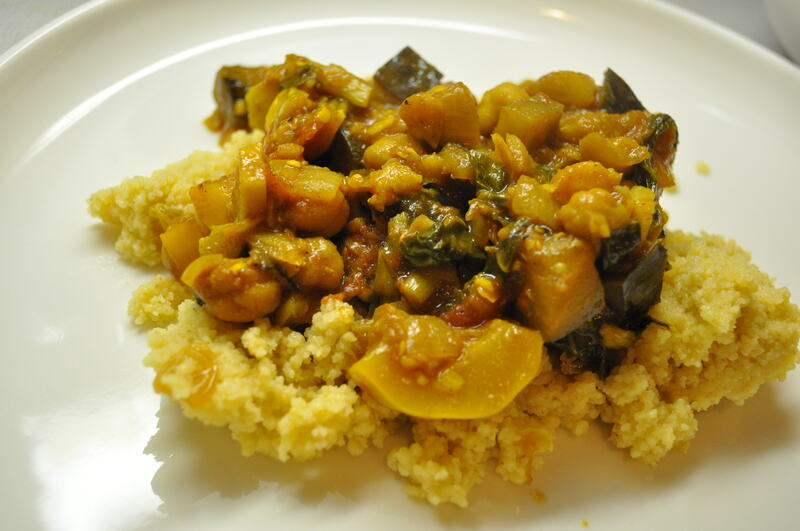 The flavor of the dish continues to improve over time and therefore makes a great leftovers dish. Recipe adapted from World of the East Vegetarian Cooking. Heat oil in a wide pot over a medium flame. When hot, add onions and garlic. Stir until rich med brown. Reduce heat to medium-low and add spice bag #1. Stir for a few seconds. Add tomatoes. Sauté until well amalgamated with spice mix- ture and brown lightly. Add drained chickpeas and 1⁄2 cup water and 1⁄2 cup broth. Stir. Add spice bag #2, salt, and lemon juice. Stir again. Add chopped cabbage. Stir again. Cover, turn heat to low, and simmer for 10 minutes. Remove cover and add minced jalapeno pepper and grated ginger. Stir and cook, uncovered, for another 30 seconds. In a small bowl, combine soy sauce through red pepper. Set aside. Heat peanut oil over medium-high in a large saute pan or wok. Add ginger through mushrooms, and cook until almost tender, about 5-10 minutes. Meanwhile, if using frozen edamame beans, microwave in a bowl, covered, on high for 1 minute. Add edamame through tofu to wok. Cook over medium heat, until kale wilts. Add soy sauce mixture. Cook for another 5 minutes, or until the kale is tender. 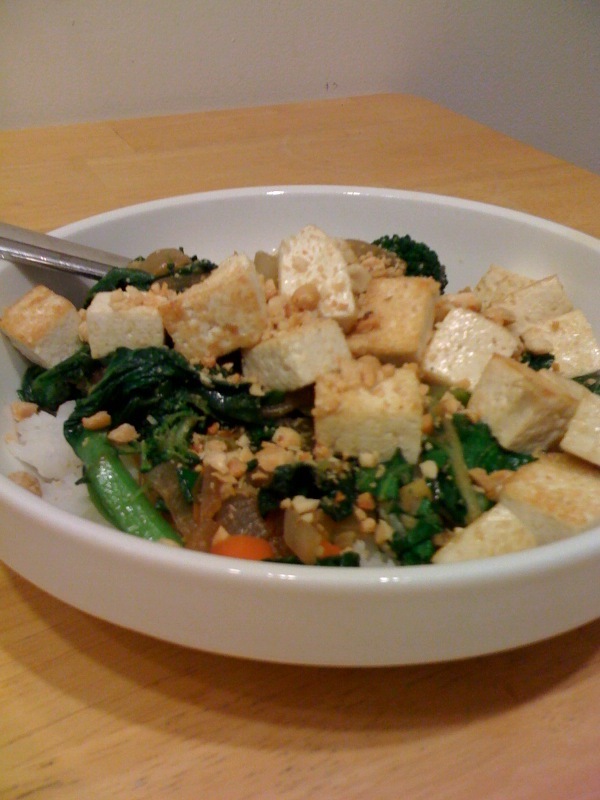 To serve, place about 1/2 cup sticky rice in a bowl, top with 1 cup onion/greens mixture, and tofu. Sprinkle with chopped scallions, sesame seeds, and chopped peanuts. 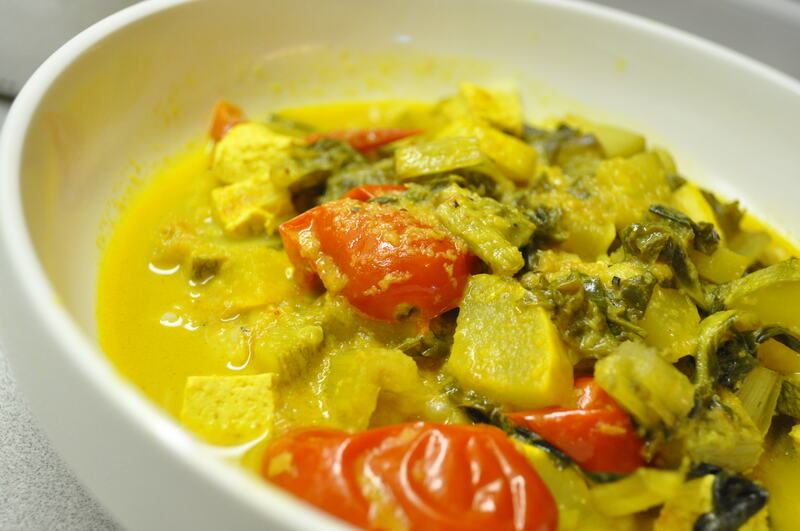 This savory dish calls for homemade curry paste. While this sounds intimidating, it’s actually quite simple and far tastier than the ground curry spice you might find in the grocery store. The broccoli rabe, swiss chard and carrots add nice vibrant color, texture, and taste. Broccoli rabe, despite its name, is actually a relative of turnips, not broccoli. The entire plant – stems, leaves, and broccoli florets – are edible. Meanwhile, saute onion and carrot in 1 tbsp extra virgin olive oil over medium-high heat in a saute pan. In a small bowl, combine the ginger, garlic, coriander and ground cumin. Stir in 1/4 cup of water to make a paste. In a small skillet, heat 3 tbsp oil until shimmering. Add the cumin seeds and cook over moderately high heat for 5 seconds, just until sizzling. Add the shallot and cook, stirring, until lightly browned, about 1 minute. Add the spice paste and let cook until most of the liquid has evaporated, about 2 minutes. Stir in the tomato paste and cook until thick, about 1 minute longer. Add broccoli rabe, swiss chard (or kale), onion-carrot mixture, canned tomatoes, three-fourths of the cilantro and the cayenne to lentils and season with salt. 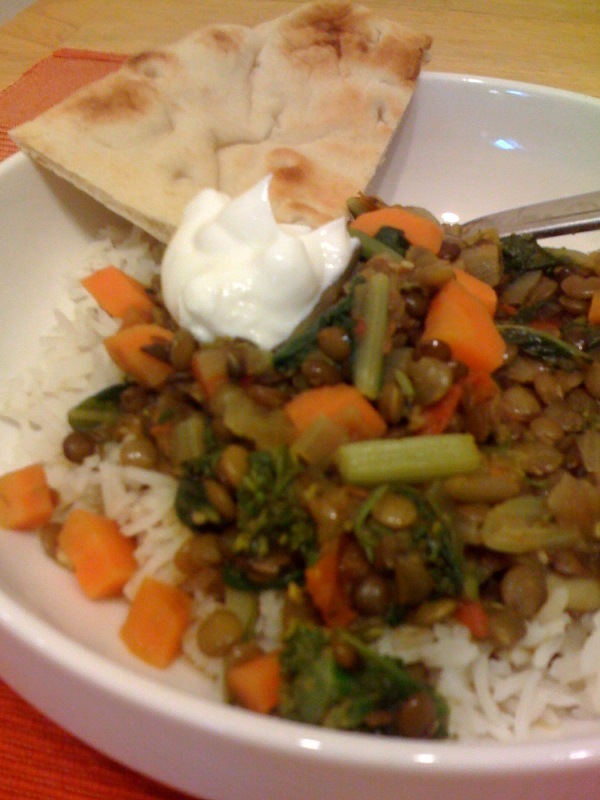 Cook until the lentils and vegetables are tender, 15 minutes. Scrape in the spice paste and the remaining cilantro. Simmer for 5 minutes, then serve. 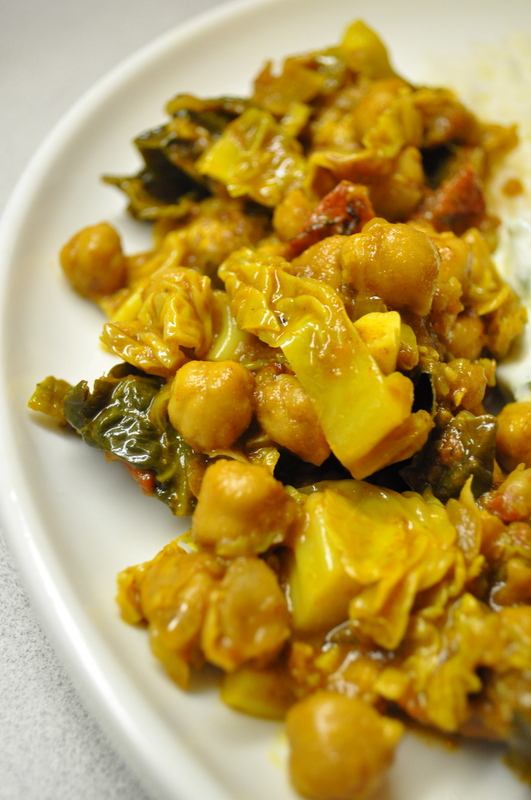 Serve with basmati rice, warm naan and plain yogurt or sour cream. In a small bowl, combine soy sauce through ginger. Set aside. Meanwhile, in a separate large saute pan, heat 1 tbsp peanut oil over medium-high heat, add tofu and saute until browned on all sides. 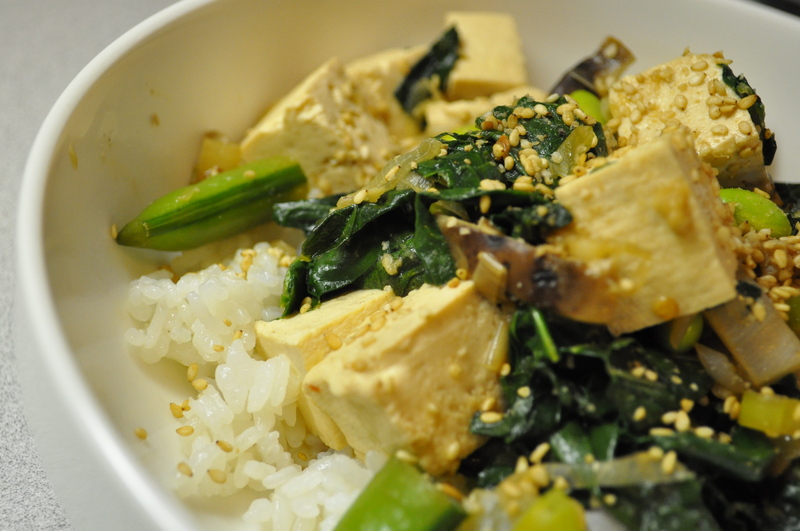 To serve, place about 1/2 cup sticky rice in a bowl, top with 1 cup onion/greens mixture, and tofu. Sprinkle with chopped green onions and chopped peanuts. 1. Heat oil in heavy large saucepan over medium-high heat. Add onion and 1/4 cup minced ginger and sauté until onion is translucent, about 5 minutes. Add chicken or vegetable stock and sliced carrots. Cover and simmer until carrots are tender, about 30 minutes. 2. Working in batches, puree mixture in blender or processor. Return soup to saucepan. Mix in orange juice, then half and half and cider. Cook over low heat 5 minutes. Season soup to taste with salt and pepper. (Can be prepared 1 day ahead. Cover and refrigerate. Bring to simmer before continuing, thinning with more stock if necessary.) Ladle soup into bowls.